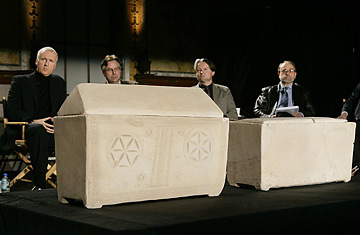 Filmmaker James Cameron and colleagues display ossuaries believe to belong to Jesus of Nazareth (right) and Mary Magdalene (left) at a press conference in New York, February 26, 2007, in connection with a documentary which Cameron has produced. Brace yourself. James Cameron, the man who brought you Titanic is back with another blockbuster. This time, the ship he's sinking is Christianity. In a new documentary, Producer Cameron and his director, Simcha Jacobovici, make the starting claim that Jesus wasn't resurrected -- the cornerstone of Christian faith -- and that his burial cave was discovered near Jerusalem. And, get this, Jesus sired a son with Mary Magdelene. No, it's not a re-make of The Da Vinci Code. It's supposed to be true. Let's go back 27 years, when Israeli construction workers were gouging out the foundations for a new building in the industrial park in the Talpiyot, a Jerusalem suburb. The earth gave way, revealing a 2,000 year old cave with 10 stone caskets. Archaeologists were summoned, and the stone caskets were carted away for examination. It took 20 years for experts to decipher the names on the ten tombs. They were: Jesua, son of Joseph, Mary, Mary, Mathew, Jofa and Judah, son of Jesua. Ever the showman, (Why does this remind me of the impresario in another movie, "King Kong", whose hubris blinds him to the dangers of an angry and very large ape?) Cameron is holding a New York press conference on Monday at which he will reveal three coffins, supposedly those of Jesus of Nazareth, his mother Mary and Mary Magdalene. News about the film, which will be shown soon on Discovery Channel, Britain's Channel 4, Canada's Vision, and Israel's Channel 8, has been a hot blog topic in the Middle East (check out a personal favorite: Israelity Bites). Here in the Holy Land, Biblical Archeology is a dangerous profession. This 90-minute documentary is bound to outrage Christians and stir up a titanic debate between believers and skeptics. Stay tuned.